Osprey Shores is a motorcycle friendly resort on Nova Scotia’s Eastern Shore. Our motel-style lodge is perfect for touring motorcycle travellers as you can park your motorcycle directly in front of your guest room. A long time supporter of the Nova Scotia Motorcycle Guide, Osprey Shores Resort has a number of special features that make it a favourite destination for touring motorcycle travellers along the Marine Drive travel trail.It doesn't take long for you to get comfortable when you visit the Authentic Seacoast. Our charming seaside village offers quality accommodations that meet the needs of all travelers, whether you are a family on a budget or someone seeking the luxuries of life. 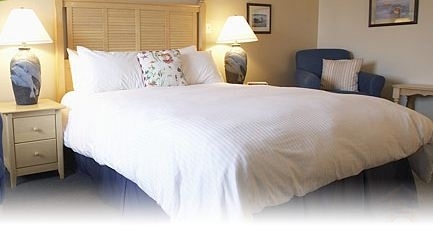 Osprey Shores invites you to unwind with 10 deluxe rooms in our motel style lodging away from the Clubhouse. Comfortable, quiet and well appointed, these quality accommodations show our attention to detail so you can relax and focus on having fun.Six guest rooms have a queen and single bed, three rooms have two double beds and one room has a queen size bed and single sofa bed. Together with our special resort activities and complimentary continental breakfast, we’re making it easy to make Osprey Shores your Nova Scotia vacation getaway. High Season July 1 to September 30: $129 per night, double occupancy + HST, $25 for additional per person. Low Season May 1 to June 30 & October 1 to October 31: $109 per night, double occupancy + HST, $25 for additional per person.